I may or may not have mentioned that April has been one of the busiest months ever. I am the kind of person who likes to relax on the weekends... or run. That's the same thing. Amiright? People are always asking me, what are you doing this weekend? The answer is usually "nothing" or "running." But not in April. I had a major event every weekend and have barely had time to breathe. Between this blog, taking care of my clients, trying to squeeze in my own workouts on top of my packed schedule, let's just say it's been challenging. It was a fun month with a race-cation, a milestone anniversary, out of town visitors, a weekend fitness professional's convention, and concerts (and meeting my favorite rock star, no biggie). I plan to catch up on sleep and sanity in May. For this week's "workout Wednesday" I am sharing three of my most popular quick strength training workouts that can be done before your run as part of a warmup or could be repeated as a circuit on non-running days. Strength training is important to becoming a well-rounded athlete. It will help you run stronger, faster and avoid muscle imbalances that can lead to injury. You can download a printable PDF version of the workouts by entering your email address below. If you are already subscribed to the blog, then adding your email address again to get the download will not result in duplicate emails. Or just save to Pinterest for later. strength training for runners. Save to your favorite Pinterest workout board for later. 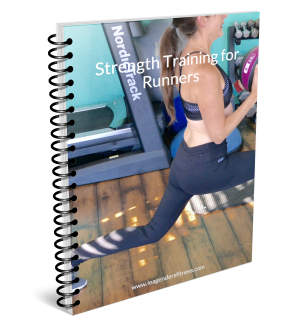 Add your email address to download a printable PDF of all three strength training for runners workouts and to receive news and updates from the strength and running blog. Questions? Need coaching? I’d love to help. Newer PostWhat Kind Of Runner Are You?